Finouche Pierre by Sylvia Natterer is a handsome 48cm tall vinyl boy doll with brown hair. 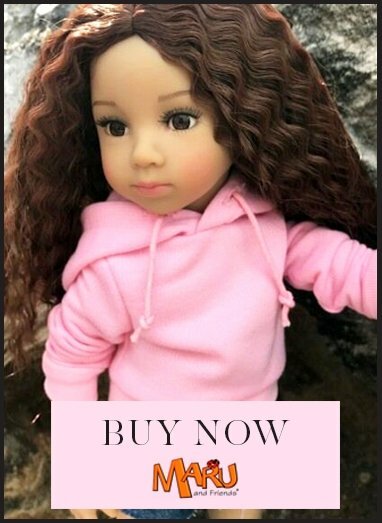 He is suitable for play for children of age 3, but also very popular with adult buyers who appreciate beautiful dolls for their own enjoyment. He's a doll Sylvia wanted to create from the very beginning of her time at Petitcollin. Now he is a reality. His body is vinyl and he has articulation at the shoulders, hips and neck. He can stand and find poses which makes him expressive and interesting in play. The Finouche body is modelled on a typical 7-9 year old child so great for slightly older children too. Pierre's clothing is a useful pair of long denim shorts which are casual and smart at the same time; a simple shirt in a coral colour, and a pair of converse-style sports shoes. He has an additional drawstring bag.